On November 29, 1965, Amherst developer William E. Aubin and his wife Sophie Aubin, filed a subdivision plan for an area on the eastern side of town called "Echo Hill South." The Aubins modeled their development after a new concept that was becoming more popular in the 1960’s—a PUD (Planned Unit Development). The Aubin's plan included the concept of clustered housing, recreational facilities and open common space. The first stage of development included a mixture of residential homes, apartments, and a swim club—centered on a series of ponds, a large open field, and forested common lands serving as a buffer between the residences. It is of some historical interest because Echo Hill South was the first such development on the east coast. It was planned and developed by the Aubins, Architect Thomas Kirley, and Tomlinson Builders. It was marketed by Key Realty. The Echo Hill South PUD incorporated a number of differences not found in other parts of the Town of Amherst. Houses were clustered closely together—the average lot size was one-quarter acre. The homes were built on cul-de-sacs or on eyebrows off the major thoroughfares, eliminating traffic noise and congestion. The backs of the homes were separated from their neighbors by forested common land of variable width and depth. The appraised land value of each lot was much higher than other parts of Amherst to compensate for the very low valuation placed on the common property. 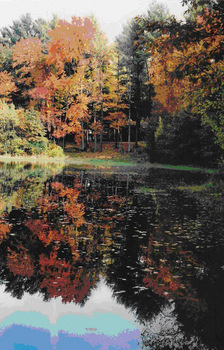 Recreational areas included a large field that could be used for numerous activities (baseball games, picnics), a series of two natural ponds draining into the Fort River, and a “Swim Club” that is presently the Hampshire Fitness Center. A group of five apartment complexes, or “courts” were included in the initial design, most of which were later converted into condominiums. A retail complex was built some years later at the entrance to Echo Hill South at Route 9, which included a small convenience store. 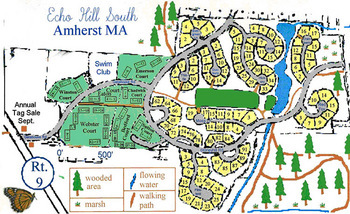 Thus Echo Hill South was envisioned as a residential community within the Town of Amherst with amenities not present elsewhere. 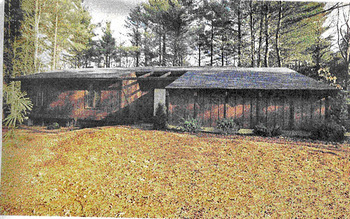 In 1967 a “Declaration of Covenants and Restrictions” was filed establishing the Echo Hill South Association, a corporation with officers and a Board of Directors “to preserve and foster the values and amenities of the residential community in and about that section of Amherst, Massachusetts, known as Echo Hill South; to encourage the preservation of parks, play-grounds, open spaces and other common facilities; and to this end to act as an agency for the acquisition, maintenance and administration of such community properties and facilities; and also to encourage, foster and participate in social activities among the inhabitants of the said Echo Hill South Community and others.” The Board was given the legal authority to collect dues for the maintenance of the common properties and the right to enforce the restrictions agreed to by all residents owning property in Echo Hill South. The Board consists of volunteers elected annually by the residents of the community. Over the years the Board has faced new challenges as the forested environment has matured, and currently allows more latitude in the cutting of trees on private property and for the modification of homes as owners request permission for additions and other external changes. One of the most daunting and confrontational challenges has been the preservation of the natural ponds around which the community was built. The ponds are silting up and are rapidly turning into a marsh. Dredging is necessary to restore them to their original condition, but their recent reclassification as “vernal pools” has prevented the Pond Restoration Project from moving forward. This is just one of the many time-consuming and frustrating activities that the Board has been dealing with. Other neighborhood associations have since appeared in Amherst: Orchard Hill, Echo Hill North, and Amherst Woods to name a few. Echo Hill South was the first, and it still serves as a model development of its type. The archives of the Echo Hill South Association have recently been donated to the Special Collections Department of the Jones Library where they are available to the public. Essay by Donald A. Proulx, President, Echo Hill South Association 2008.